form (Type 32 Guntō Kai). This was Japanese sword form only the hilt, and the scabbard was a saber form as usual. 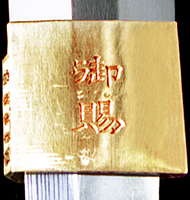 Guntō for officers. This is the army formality Guntō (common-name Type 94) of the 1934 establishment. It became March 10 enforcement of the Army Day. The 26th regiment of the 40th brigade field gun of the 20th army division (Seoul) infantry. 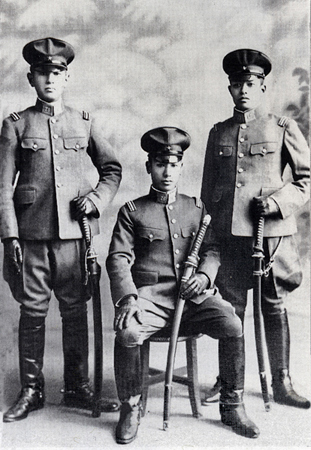 From the left, each second lieutenant of the Yasumura Shimizu, Yasuji Mitsugu, and the Yatao Nakamura. The 50th term of a military academy. Commemoration photography of second lieutenant appointment in 1937. Three officers are wearing 1930 (the Sho-5 type military uniform, a stand-up collar). are wearing a Czechoslovakia style an army cap. Fancy youth officers of those days were fond, and put on this. Type 94 royal gift Guntō "Yasunori"
Spring-clip, Openwork guard, With the tassel for field officers, Overall length: 100.5�p. A mounting is as adopted-types regulation. A guard is golden. A scabbard, metal fittings, and a Tsuka-ito are blackish brown. Round string Knot loop. It is a near condition intact. Yasukuni swordsmith: Real-name is Kenzō Kotani. He was born to 1909 in Hiroshima Prefecture. Hayashi army minister in 1935. He wins a chairman prize at the Guntō exhibition of the second army. He established forging workshop also at the house and started the sword making in 1938. The Mei stamped with "Takenori"
Three sorts of second suspension mounts of an attachment-and-detachment type.